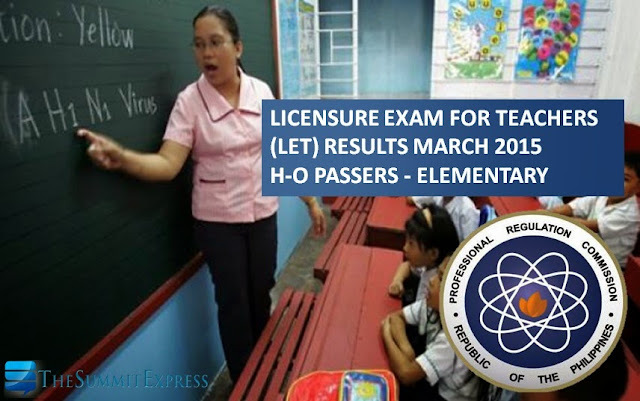 The much-awaited list of passers for Teachers board exam or Licensure Examination for Teachers (LET) given last March 29, 2015 is now available online today, May 23, 2015. The Professional Regulation Commission (PRC) and the Board for Professional Teachers (BPT) announces that 12,103 elementary teachers out of 44,144 examinees (27.42%) hurdled the Licensure Examination for Teachers (L.E.T.). It is further announced that of the 12,103 elementary teacher passers, 5,607 are first timers and 6,496 are repeaters. Takers may now view on this page the alphabetical roll of passers for H to O Surnames.